Save yourself time, money and stress by avoiding these common mistakes. They can have a big impact on your success. 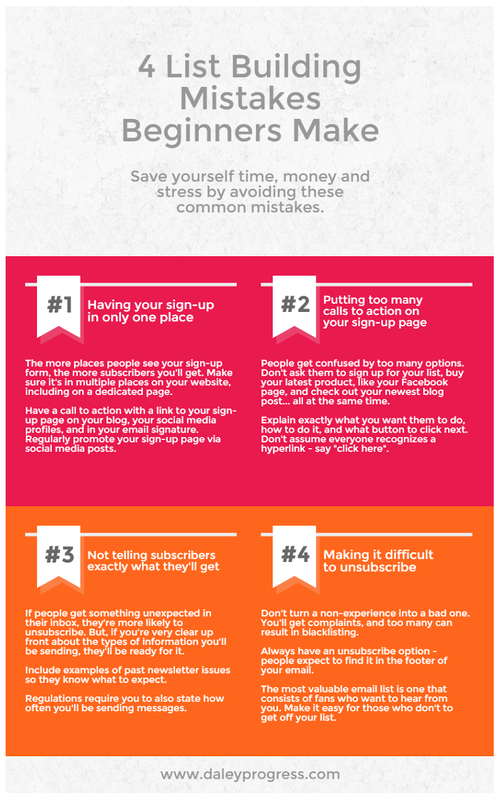 The more places people see your sign-up form, the more subscribers you'll get. Make sure it's in multiple places on your website, including on a dedicated page. Have a call to action with a link to your sign-up page on your blog, your social media profiles, and in your email signature. Regularly promote your sign-up page via social media posts. People get confused by too many options. Don't ask them to sign up for your list, buy your latest product, like your Facebook page, and check out your newest blog post... all at the same time. Explain exactly what you want them to do, how to do it, and what button to click next. Don't assume everyone recognizes a hyperlink - say "click here". 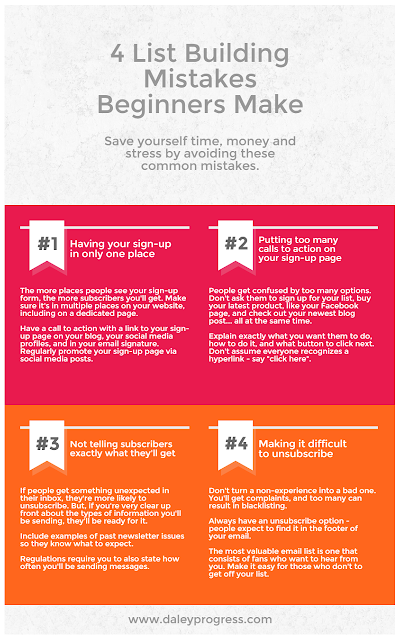 If people get something unexpected in their inbox, they're more likely to unsubscribe. But, if you're very clear up front about the types of information you'll be sending, they'll be ready for it. Include examples of past newsletter issues so they know what to expect. Regulations require you to also state how often you'll be sending messages. Don't turn a non-experience into a bad one. You'll get complaints, and too many can result in blacklisting. Always have an unsubscribe option - people expect to find it in the footer of your email. The most valuable email list is one that consists of fans who want to hear from you. Make it easy for those who don't to get off your list. TAKE TWO: Thanks Linda! This is good, clear, concise advise -- my favourite kind! I shared on Twitter. I think my followers there will love this too.